With the Andros Island and other parts of the Bahamas in the backdrop, NASA astronaut Sunita Williams and Japanese astronaut Akihiko Hoshide (out of frame) work on the exterior of the International Space Station during an Aug. 30, 2012 spacewalk. Two astronauts will venture outside the International Space Station Thursday (Nov. 1) to isolate and repair an ammonia leak in part of the orbiting lab's cooling system. NASA astronaut Sunita Williams and Japanese spaceflyer Akihiko Hoshide are slated to start the spacewalk — also known as an extra-vehicular activity, or EVA — Thursday at 8:15 a.m. EDT (1215 GMT). They're expected to stay outside for about 6 1/2 hours, NASA officials said. 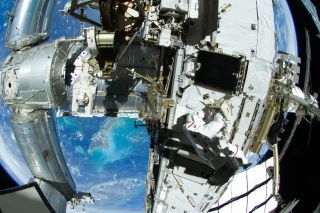 You can watch live coverage of the spacewalk here on NASA TV, beginning at 7:15 a.m. EDIT (1115 GMT). On Thursday's EVA, Williams — commander of the station's current Expedition 33 mission — and Hoshide will make their way over to the port side of the station's backbone-like truss. They'll reconfigure some lines in the affected coolant system and install a spare radiator to see if that stops the leak. Spacewalks are always challenging, but Thursday's EVA is unlikely to throw anything at Williams and Hoshide that the two astronauts can't handle. In late August and early September, the duo replaced a vital power unit over the course of two spacewalks, defeating an unexpectedly stubborn stuck bolt in the process.